Serracor-NK is free of pesticides, chemicals, preservatives, animal derivatives, dairy, yeast, fish or shellfish, peanuts, and tree nuts. All individual enzymes are kosher-certified ingredients, and suitable for vegetarians and vegans. Day 12+: Therapeutic Dose 3 capsules, 3 times a day. Therapeutic Dose: Maximum capsules needed for desired effect. Specialty Enzymes & Biotechnologies (SEB) is a major international manufacturer of enzymes for more than 20 industries, including the nutraceutical industry. Vic Rathi, president and founder of SEB, formulated the original Neprinol® for Arthur Andrew Medical (AAM), an enzyme marketing company. The proprietary formula remains the intellectual property of SEB; AAM was not privy to the formula. SEB did not provide any Neprinol product to AAM in 2009, so any complaints or refunds made thereafter were not for its products. A major distributor who worked with AAM at the time says they did not receive any complaints nor requests for refunds, and there was no apology issued to customers. 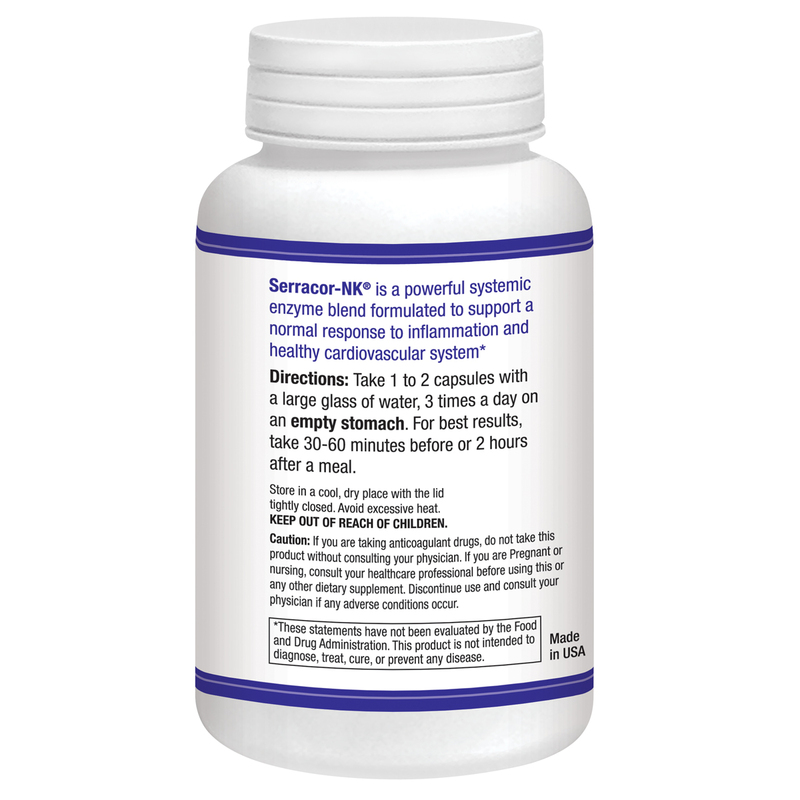 Initial production and sale of Serracor-NK was the result of feedback from previous Neprinol customers who contacted SEB as the manufacturer, requesting the original SEBkinase formula. The quality of SEB products and services are evident in the fact that it has been in business for more than 50 years and continues to experience tremendous growth. In fact, in 2010 SEB expanded its manufacturing facilities, adding a new 25,000 square foot building to meet growing manufacturing demands. Thousands of satisfied customers can attest to the quality and efficacy of our products, and the integrity of our business practices. Specialty Enzymes did not change the formula for SEBkinase or the original formula for Neprinol, which is now available from AST Enzymes as Serracor-NK. Claims that we allegedly lowered the activity of SEBkinase in the original Neprinol formula are untrue. Our SEBkinase blend is unchanged since its introduction. The SEBkinase in Serracor-NK is the same as the SEBkinase in the original formulation of Neprinol. Nothing has changed but the name. All enzymes have a pH range. At the extremes of this range, whether acid or alkaline, systemic enzymes will denature (become irreversibly inactive). While it is true that most fungal and plant source systemic enzymes exhibit a fairly broad pH range, some bacterial sourced systemic enzymes are less tolerant of low pH. Because we are the actual manufacturer of our enzymes, we test them for both pH and temperature stability. 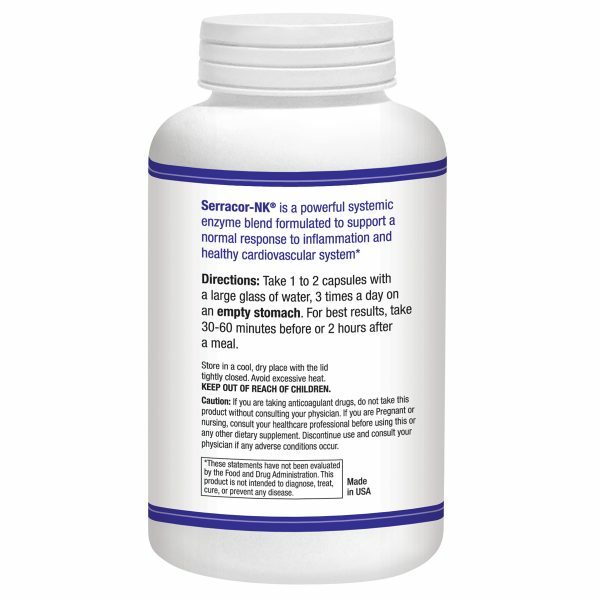 Based on the results of these kinetic studies, we have repeatedly demonstrated that serrapeptase and nattokinase are much less tolerant of a low pH and will begin to lose activity in acidic conditions consistent with the stomach. Therefore, for maximum effectiveness, serrapeptase and nattokinase are best when enterically coated. When we design a systemic enzyme blend for human consumption, we have to ensure that it will tolerate the pH variables of our gastrointestinal system. We have successfully done this with our systemic enzyme products, including Peptizyme SP (enteric coated serrapeptase), NattoSEB (enteric coated nattokinase) and SEBKinase (a blend of Peptizyme and NattoSEB). As a result of our experience and expertise, our entire line of enteric-coated enzymes are able to reach the small intestine with higher activity for full systemic enzyme therapy. ** Neprinol® and Acid Armor® are registered trademarks of Arthur Andrews Medical Inc., which is not affiliated with, nor sponsors or endorses this product or any other product from Specialty Enzymes & Biotechnologies or AST Enzymes. Systemic enzyme therapy refers to the therapeutic use of natural enzymes to produce a desired effect. Systemic enzymes are absorbed from the small intestine where they enter the bloodstream and execute their effects on the entire body as a system. Proteolytic enzymes break down proteins into their building-blocks, which are called amino acids. Systemic proteolytic enzymes are responsible for breaking down accumulated protein and waste substances found in the circulatory system and connective tissue. Regular systemic proteolytic enzyme use can promote circulation and support flushing out these waste products. Fibrin is a protein-based substance that is needed to help clot one’s blood, playing a substantial role in immune response and healing. When the body responds to injury or chronic inflammation, fibrin is recruited to the damaged area to form scar tissue. Although the body is equipped with plasmin, a naturally occurring enzyme responsible for breaking down excess fibrin, some people are at a disadvantage – as aging occurs, plasmin levels progressively decrease. Yes, the serrapeptase and nattokinase in Serracor-NK are enterically coated. While similar systemic enzymes may have the same active ingredients, most do not utilize enteric coating. The purpose of enteric coating is to protect the enzyme from the acidic environment of the stomach. When enzymes are enterically coated, their high activity levels are preserved until theyreach the small intestine, where absorption into the bloodstream takes place. While the enteric coating can withstand the acidic environment of the stomach, the alkaline environment of the small intestine will disintegrate the enteric coating, allowing the enzyme to become active within the bloodstream. No, our enteric coating does not use or contain phthalates. At AST Enzymes, we use Methacrylic Acid Copolymer (MAAC) for our enteric coating. Compared to other commonly used enteric coating agents such as Cellulose Acetate Phthalate (CAP) and Hydroxypropyl Methycellulose Phthalate (HPMCP), MAAC is the most gastro-resistant and does not carry the same risks. Additionally, MAAC is considered GRAS (Generally Recognized as Safe) by the FDA and is approved for use by the European Food Safety Authority. To learn more about enteric coating used in AST Enzymes products, please click the “Compare” tab. The use of Serracor-NK has not been shown to exhibit detrimental effects, long term or short term. Minor side effects may vary. Gastrointestinal disturbances have been reported by a small percentage of new users, but once the dosage is adjusted, tolerance is maintained. Minor allergic reactions, like reddening of the skin, are also rare occurrences, and can be seen with extremely high doses. There are no known interactions with prescription or over the counter drugs while using systemic enzyme therapy. However, it is recommended that you consult with your physician about starting systemic enzymes, particularly if you are on blood-thinning medications, or are pregnant or nursing. Systemic enzymes may be taken together, yielding desirable results, as long as they are taken on an empty stomach. In fact, it is often recommended that systemic enzymes be combined. 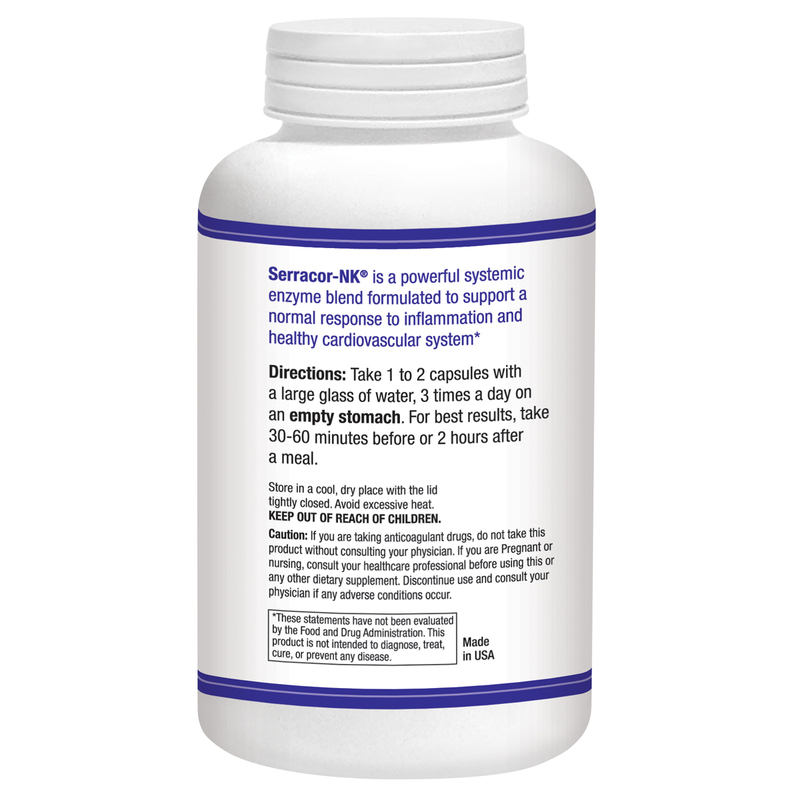 Products like Serracor-NK and Peptizyme-SP often have synergistic effects when taken together. This means that the separate products work together to produce advantageous results. 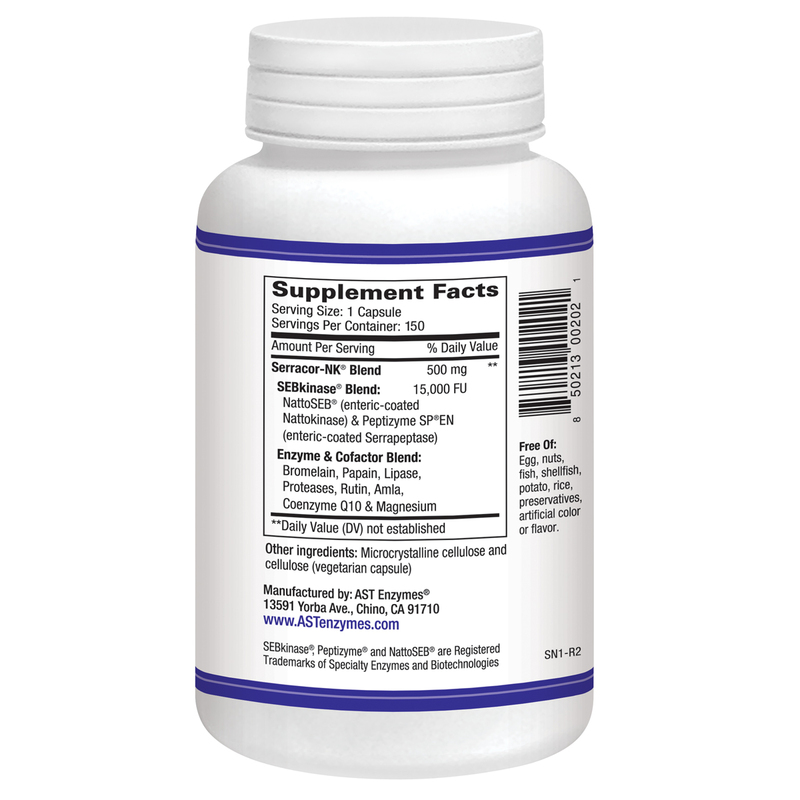 By combining and enhancing the activity of the enzymes, their effects on supporting the body are more attainable. I’ve been using Serracor-NK for about 7 years now. The CoQ10 is great for energy and mental acuity! I’m pretty sure it’s the effect of the fibrin metabolism that supports my vision. I am 64 and still don’t wear glasses, for reading or otherwise. The magnesium support has a nice calming effect on the nerves, I find. I may get a cold every 5-6 years, but that’s it. 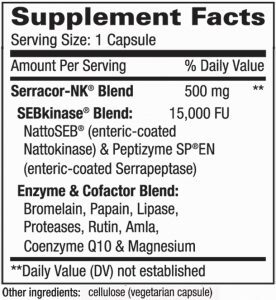 I found out the hard way, by forgetting to pack my Serracor-NK for a trip, exactly what benefits I’m getting from this enzyme supplement. And I don’t want to be without it again! Thank you! It’s healthy in so many ways. 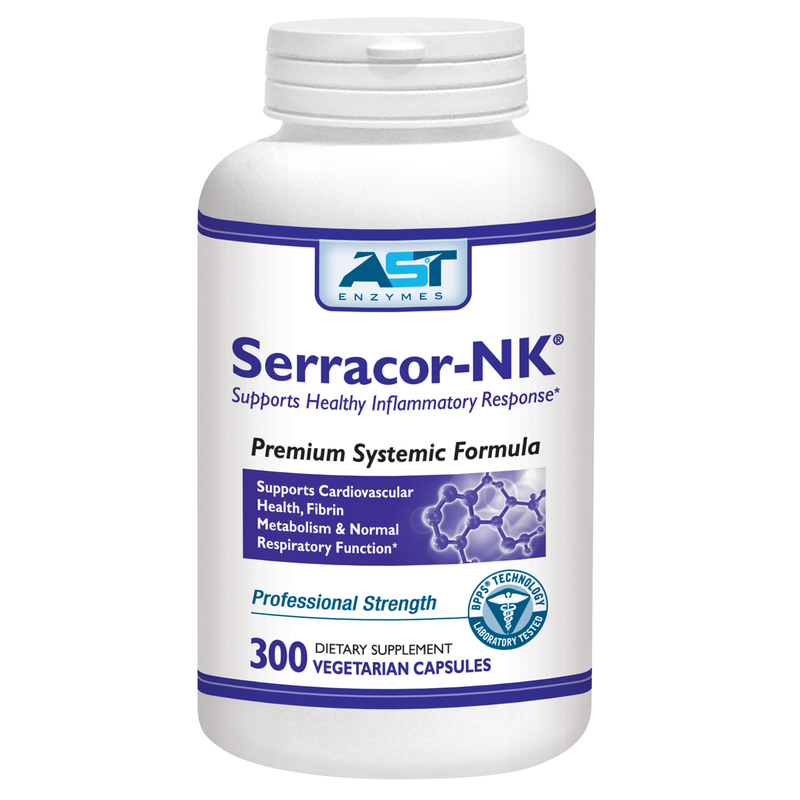 Serracor-NK helps to clear my lungs of congestion and helps me breathe better. I would highly recommend it. 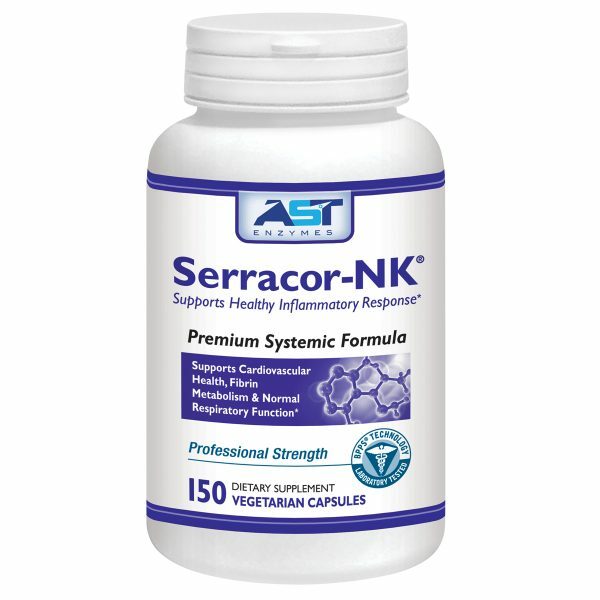 My wife and I both have been taking serracor-NK daily for well over 5 years. My wife is 68 and I am 69. We are no strangers to hard work. We own and operate a farm. Our blood pressures are both in the 120’s over 60’s. We walk 3 miles everyday, eat well and take 4 serracor-NK caps on an empty stomach before bed. We never have congestion and seldom experience sore joints. Injuries heal rapidly. This supplement is extremely good for your total health. We are both big fans!!! Been using it for five years. Wonderful results! Overall health seems to be improved. Look much younger and am more vibrant than my peers. Look forward to continuing with the routine! I noticed my circulation improved, cold feet and hands warmed. I plan to reorder to see if serracor can help with mucus congestion and lung issues. From other reports, I suspect continuing on this product will assist in easing breathing problems. I may return and give it a 5 if I see continued improvement. Good general health, less muscle soreness after working out. I am an active 71 yrs, still playing hockey! I am a male aged 51 and I want to say that I Love AST Enzymes Serracor-NK. It has really improved my health since I started taking it about over 2 years ago. My circulation, breathing, and general body flexibility all feel better when I take it and my whole body is less sore. Everything seems to heal faster and feel better. I want to thank AST Enzymes for their life changing products! I am a customer for life! 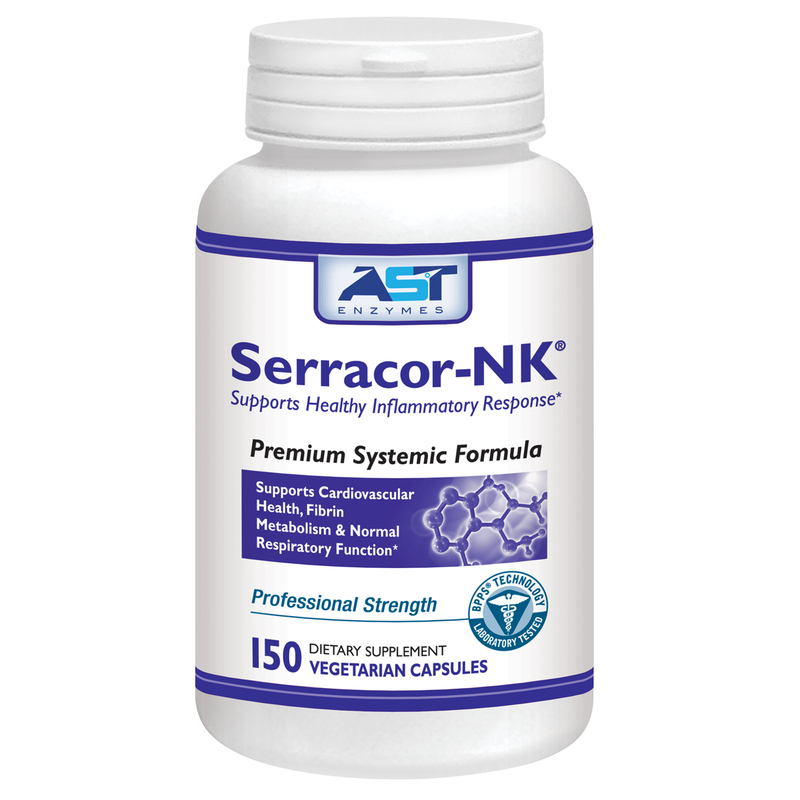 have been using Serracor-NK for 18 months now to improve circulation in my legs, reduce ankle swelling and insure healthy PSA and good cholesterol levels. I am completely satisfied with the results! Floracor-GI with Serracor together provide even greater benefits. One of our most popular blends, Floracor-GI is a blend of probiotics, prebiotics and powerful enzymes to support gastrointestinal health, microflora balance and immune health. Combining Floracor-GI with the powerful systemic enzymes in Serracor-NK supports systemic enzymes therapy, circulation and respiratory health. DigeSEB-GI is a broad-spectrum digestive enzyme blend to support digestion of all types of foods.